I have a treat for you today! These Salted Caramel Crispy Cookies need to be made asap! All you need is 4 simple ingredients!! My older daughter LOVED them and so did my husband. You all know that I am a big fan of salted caramel anything, especially these cookies. These cookies need to be kept in the freezer, but they are easy to eat straight from it. Not hard as a rock, but perfect. These Salted Caramel Crispy Cookies are no bake, gluten free and vegan. The perfect summer dessert! If you need more uses for crispy rice, check out this post too. Sweet and salty cookies with a crunch! Drain the dates and add them to a food processor with the cashew butter and sea salt. Blend until smooth. Transfer to a bowl and mix in the crispy rice. The mixture will be thick. Place cookies in the freezer for 15 minutes to set. Keep these cookies stored in the freezer. They will be too soft in the fridge. They should last a long time in the freezer. 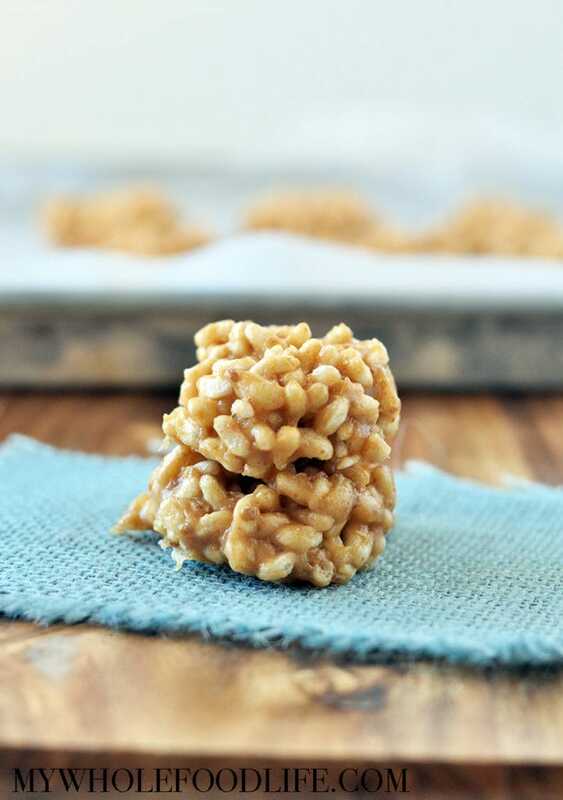 These are like healthified rice krispy treats! YUM! I can't resist salted caramel! These look like the perfect summer treat!